Hot off the press from a luxury South African safari lodge. I recently traveled to South Africa for the first time ever. I started out my trip by exploring Cape Town and the region’s Winelands with Roar Africa. Then I went on to do a luxury South African safari in Kruger National Park at the enchanting Royal Malewane. What a rush of the senses! Royal Malewane is part of The Royal Portfolio. It is a romantic yet adventurous luxury South African safari lodge that sits right smack in the middle of the bush. It is unfenced, and wildlife can walk right onto the grounds. 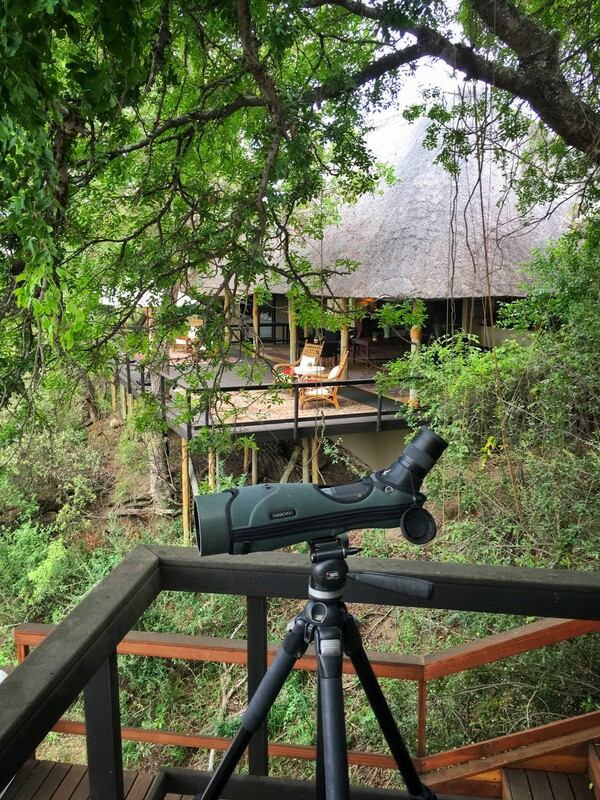 This means that while you’re relaxing by your private plunge pool, sipping on your Amarula, you may be visited by one or all of the big five. When I first arrived at the property, we got word of a leopard on the back patio and we ran over to snap a few photos! This was my first encounter with a leopard, and she took my breath away. The pattern on her silky coat and the black lining around her eyes almost put me into a state of hypnosis! After that I was lucky enough to encounter her a few more times during my stay. To my delight, I also saw impalas, buffalo, and elephants grazing around the grounds. There were many things I loved about staying at Royal Malewane, but I want to highlight the fact that it was wonderfully cozy, peaceful, and quiet. It was a place where I felt immersed in the natural habitat of the bush, without a crowd of other tourists around. This is because it is made up of just six Luxury Suites and two Royal Suites. So even at full capacity, this place would never feel anything but intimate and magical. But if by chance you want to have a group safari experience, Royal Malewane has a vibrantly decorated exclusive 6 bedroom bush villa guests can rent out, called Africa House. Each suite offered by Royal Malewane is actually a private little villa with its own patio and plunge pool overlooking the bush. They do not share any walls with the other suites so it is completely private. The bathrooms are gigantic and offer beautiful bathtubs and outdoor showers; although the indoor showers are so large and plush they have been referred to as a car wash! The suites come furnished to the nines with every single thing you could possibly want – including a pantry full of yummy snacks. But watch out, because if you leave food out, monkeys may try to break into your room and eat your food! It’s all part of the bush experience y’all! The game drives were fantastic. We spotted the big five on our first drive, thanks to an amazing guide and tracker. They brought us thrillingly close to the animals. We were able to watch a lioness and her cubs from just a few feet away. The Rhinos let us get even closer and did not seem to mind our presence at all. We spotted leopards multiple times and I was able to capture some great images with the help of my guide and his advanced knowledge of photography. The award winning spa at Royal Malewane was worth coming for on its own. It consists of a beautiful lap pool, steam room, hot and cold African baths, a gym, cabanas, and several treatment rooms. They use products with indigenous ingredients and offer lavish treatments that help to unwind after a day of bush adventure. 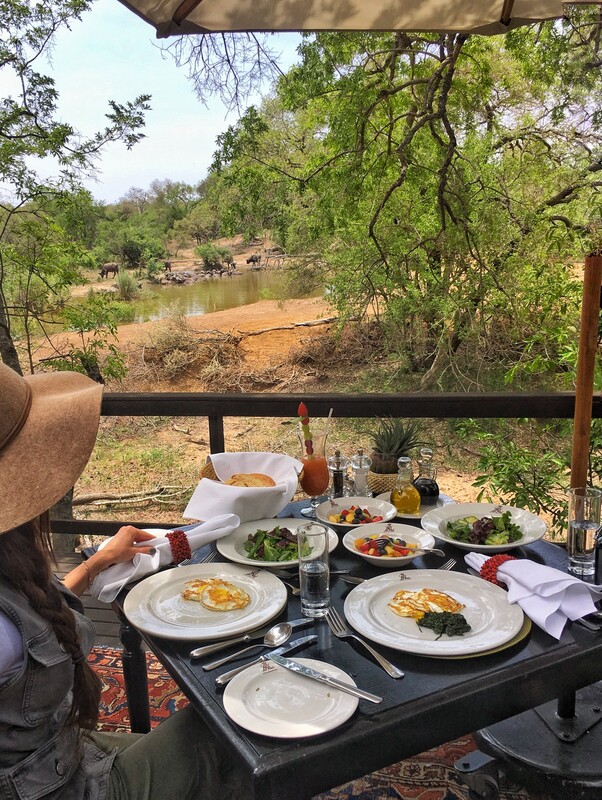 The bush dining experiences were nothing short of amazing. I was able to witness wildlife while dining in the restaurant area as it overlooks a watering hole. For each meal I had a personal menu customized to my dietary requirements. It had so many flavorful and indulgent dishes (with fabulous wine pairings) that when I got home I felt I’d never be able to eat my own cooking again. The staff was so friendly and they gave such great service! On our last night they even did an African song and dance performance while we ate. In a nutshell, the authentic and enchanting bush experience a Royal Malewane should not be missed. It’s one of the most memorable trips of my life. ♦ This property can be booked through ROAR AFRICA. Roar Africa is a team of highly knowledgeable travel experts who can help you create the African adventure of your dreams. ♦ SAFARI TIPS: If you’d like to know more about what to expect on safari, please see the article I wrote for Luxury Retreats Magazine, 10 Tips For Getting The Most Out Of Your African Safari Experience. I was hosted as guest of this luxury South African safari by Roar Africa and Royal Malewane, but the opinions expressed in this article are, as always, my own. What an incredible experience! This place looks amazing!!! This post is incredible!! What a truly one of a kind place. I feel like I’m experiencing it all through your story. What amazing photos!!!❤️? Seriously looks like a dream!! I love your wildlife photos and I would love to have breakfast out on that deck!! Hi Erika, these boots worked great for safari and they are from Timberland. What a truly special place, you really can’t beat a safari, there’s nothing quite like it!